Founded as a startup in 2008, OneSource Virtual provides clients with a one-stop-shop for employee information management and fulfillment services, including Workday deployment, training and internal services. The company quickly outgrew its facilities, requiring a new and larger single-tenant space able to host everything from weeklong client trainings to creative amenities for employees. 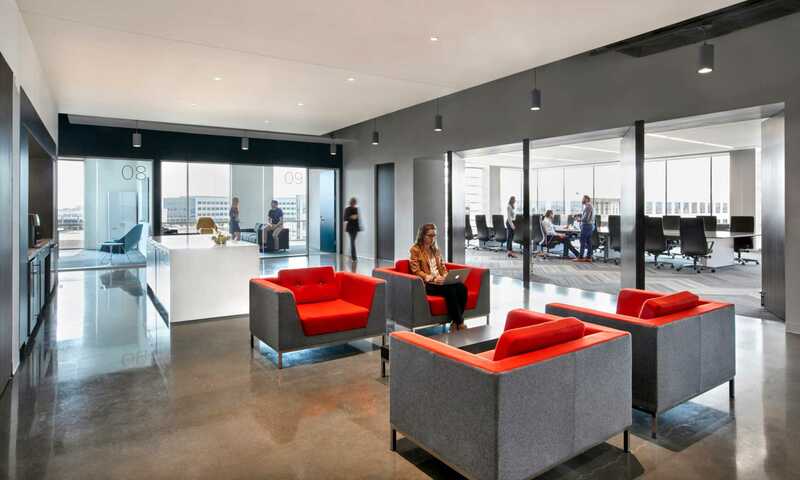 We designed the space to meet the needs of a multigenerational workforce. The environment supports a variety of work styles and balances a need for customer privacy with open-door access for employees. The new design elevates both the employee and client experience. Our design team conducted on-site observation and interviews with department leaders, setting the stage for a fun, fresh and transparent design. The debut of the new headquarters coincided with the roll-out of new OneSource Virtual brand identity. Bright environmental graphics and a dynamic open layout set the tone for collaboration and teamwork. To showcase OneSource Virtual services for clients and job candidates, the new space highlights public work and amenity spaces on Level 1 with more secure work spaces on upper floors. A tour guides visitors past fulfillment services, located behind secure windows to show the space without compromising OneSource Virtual’s high level of client security. A spacious lobby provides shared amenities such as self-serve food and coffee for customers and employees alike, as well as a gathering spot for company announcements and events. 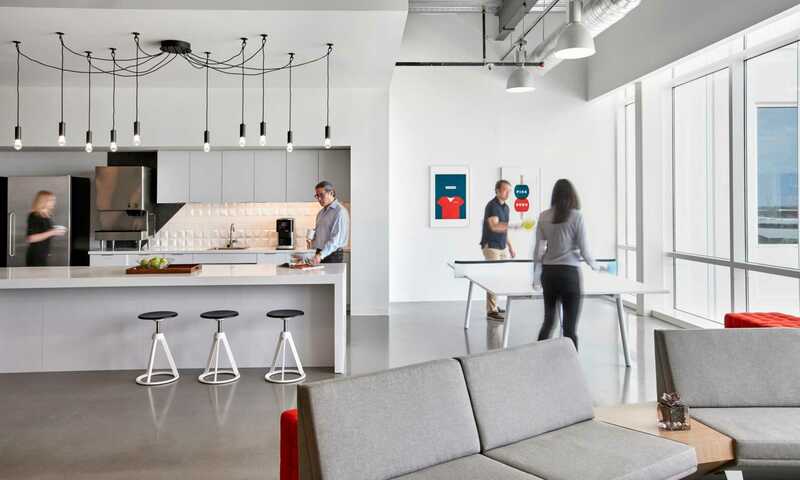 A third-floor collaboration hub serves as a social connector between the upper floors, and features amenities such an espresso machines, a ping pong table and lounge seating to encourage impromptu gatherings. 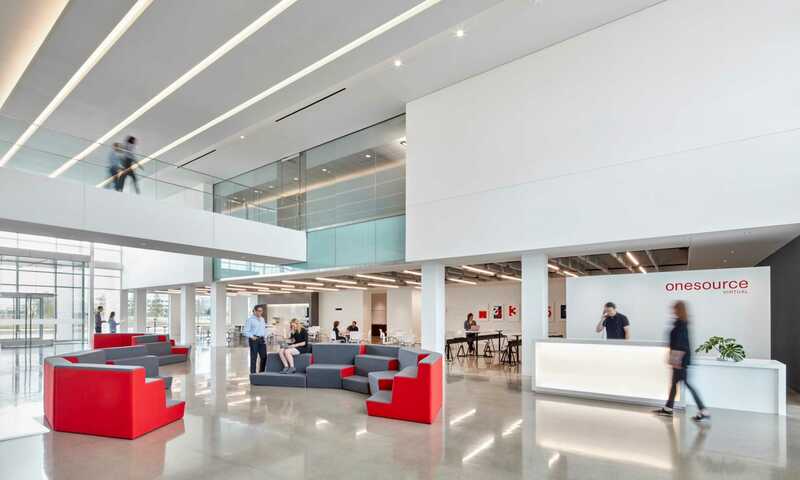 The new headquarters celebrates the rich brand and culture of OneSource Virtual. More than 1,000 on-site employees now have open-door access to executives as well as more discrete areas that protect customer privacy. Reallocating space from unoccupied, assigned offices — often the largest spaces for the least present population — created more room for shared needs. Today, each employee has at least 180 square feet of usable space.